The first Bavarois mitten is history! This means it's time to start the second one, a prospect that is not seeming all that bad. Usually I run from second mittens, having (most likely) burnt myself out on the first one, but these ones are different. The nice stretch of plain Stockinette on the palms takes the edge off all that twisting. 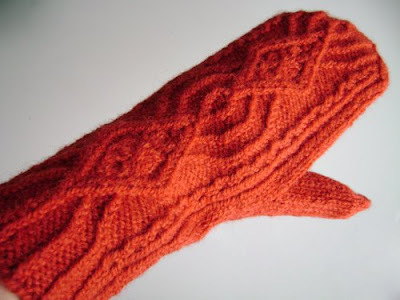 Here it is flat: I was going to go with a gusset thumb but I bailed at the last minute. Going with a peasant thumb is another one of the small mercies that these mittens have to offer. They're not so bad! If you're eyeing these hungrily, I am happy to report that I'm in the process of writing up the pattern. I mean, if anyone wants it. January 10, 2009 at 2:22 p.m.
Having a bit of second mitten syndrome myself. You did it again, and in my favorite color, Orange!! January 10, 2009 at 2:42 p.m. I would LOVE the pattern. 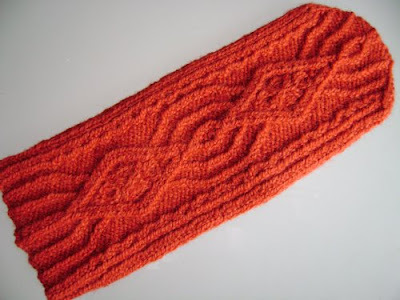 I have some Jamieson's yarn that would look great in this! January 10, 2009 at 5:04 p.m.
Nice mitten, lady! Also, loving that new user pic. Does this mean you got that straightener you'd been hankering for? January 10, 2009 at 6:21 p.m.
January 11, 2009 at 10:26 a.m.
Of course we want it!!! January 11, 2009 at 8:58 p.m. I love that cable! Pretty! January 12, 2009 at 7:39 a.m.
Hey -- it's not a mitten!